For many golfers drive if the defining moment of the game. But the final outcome of the match is often defined a few steps from the hole. And also a good training, made up of small but precious tricks, can prove to be a fundamental tool to avoid being put under pressure on the green. 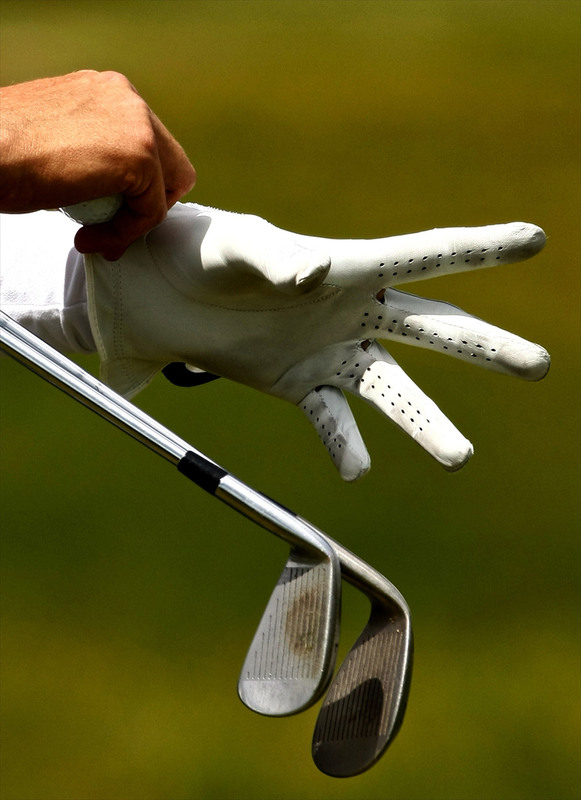 With an effective approach, you will also have the chance to achieve a „one putt“ goal, saving a stroke. With a heavy or a thin shot, on the contrary, also the best drive or long iron will be vain, causing evident wakes on golfer’s self esteem. To help you find useful insights on how to get ready and improve for short putt, I am more than happy to share with you some tips to enhance your technique, but also to choose the best solution when it comes to short strokes and you are determined to achieve the best result when getting closer to the flag. Starting from this last point of indisputable evidence, you will understand why the short putt ist the most important, to some extent the defining part, of golf. 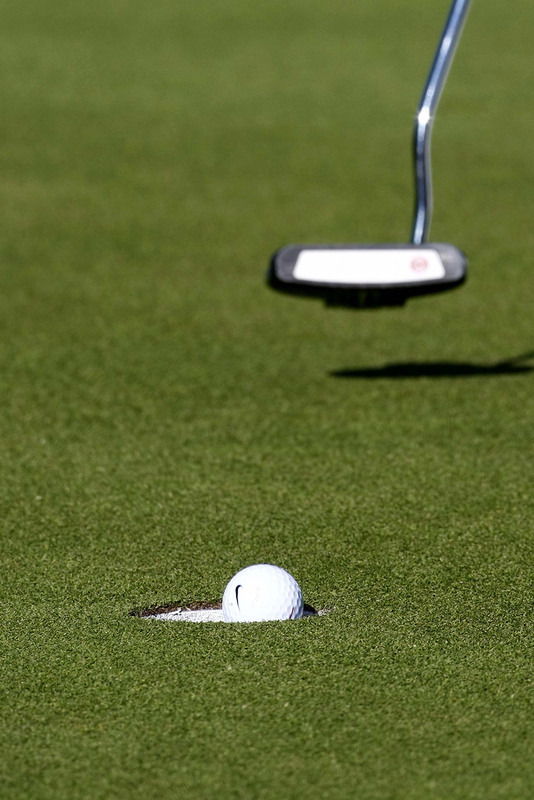 With more than 60% of the strokes thrown in a single putt (100 meters from the hole), this is the most stressful moment of the game for a golfer and the one that guarantees better results. In this first occasion we want to focus out attention on the so called „chip“, an highly performing stroke which is really useful when you find yourself close to the green and there is no necessity for a high shot. To enhance your performance on the green, you’ll have to make a distinction among two different key concepts: on one side, the issues related to the quality of the contact between the club and the ball (insufficient tecnique), on the other side the choice of the type of shots according to your evaluation of parameters (incline, green compactness, ball lie, wind, etc.). In the first case, which affects the majority of golfers at a medium and high level, a few technical tips can help you to reach the goal of the tree strokes – in other words, the ability to hit a shot reaching a security distance from the hole and thus enabling no more than two putts. The tree strokes goal is very interesting. I’d recommend you avoid heavy and thin shots, which are the enemies par eccellence of the game: the set up is crucial. The body should be slightly bent on the left side (Picture 1a) to make sure that the sternum vertical axis is placed on the left of the ball (Picture 1b), exactly at the center of the stance (Picture 1c). 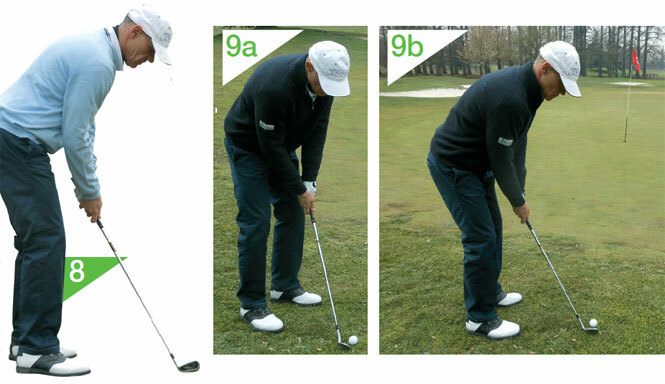 Put your hands in front of you, with the top of the grip aligned with your left leg (Picture 2 and 3), whith the body weigh on the left, also during the backswing (Picture 4). These tree factors secure a downward contact with the ball, which is the real secret for a good contact. 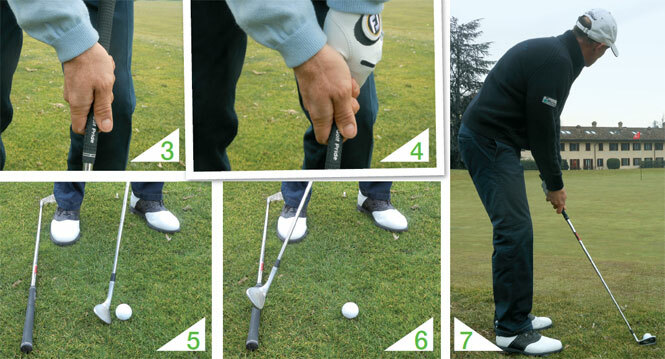 A good exercise is leaning a club in front of the right foot, with the grip on the target line, behind the ball (Picture 5). The one who succeds in not hitting the grip with the head of the club in the downswing will achieve a good contact with the ball (Picture 6). Repeating this exercise will help you to adopt this position and motion naturally, so that you will achieve good contact and a better control. Short game is a matter of technique, but also of right choices when it comes to club selection. Learning to use the different clubs is not only the way to hit succesful shots, but also to broaden the series of choices at the golfer’s disposals in different situations. For the ones who already have a good technique, the focus on details is vital to achieve the goal of the two strokes: the up & down (one to reach the green and the other to hole the path). This is what low handicap golfers should achieve to improve their performance. To acquire the ability to get it up and down around the green is what can really make the difference at the end of the day, giving you an awesome result if the long game has been good and a satisfactory result anyway when the long game has been pretty unfair. Statistics reveal that the majority of the ups & downs are made with a top quality approach and a short putt, and not with a poor quality approach and a long putt. The bogey in professional golf is often originated by a wrong putt from a meter and a half after a mediocre approach. Short game is undoubtly a matter of technique, but also of right choices, of club and type of shots. So learning the technique testing different types of clubs, is really useful to get good contact, but also to enlarge the range of shots at the golfer’s disposal in the different situations. The choice of a proper iron is crucial to secure success. To make the right choice, you have to consider the distance between the fringe and the hole. If the flag is very far (at the end of the green), you’ll probably need to have the ball rolling and that’s why I suggest you choose a 6/7 iron (Picture 7). Among the aspects deserving an higher level of attention, there is an element which is crucial for low handicap golfers and which deeply affects the quality of short game: the green. You have to keep in mind that the greens are never the same from day to day. Many players don’t pay enough attention to the greens they are playing on in a given day: humidity, grass lenght (more humid at dawn and slower in the evening) or the wind can dry them and make them faster than normal. Experienced golfers develop a peculiar feel also through their feet, thus managing to guess correctly the soil compactness and, consequently, the ideal point to lay their ball. Two examples of different situations are on one side a fast green, hard, on a down slope, with the wind on your back and from a lie in the rough (maximum roll); on the other side a slow green, wet, uphill, into the wind and from a fairway lie (minimum roll). What really makes the difference between an average chip and an excellent one is the capacity of addition and subtraction of these variable factors, which influence the speed of the ball. They often mix up and the funny aspect of the short game is that each shot is different from another. These are the reasons why I prefer short game lessons on the course. These lessons, together with a good practice regimen around the green, are by far the most effective way to improve one’s score and handicap in many shots. Book your lesson to experience all the advantages of our exclusive technology and discover our cutting edge putting platform Quintic, ideal for golfers of all level.